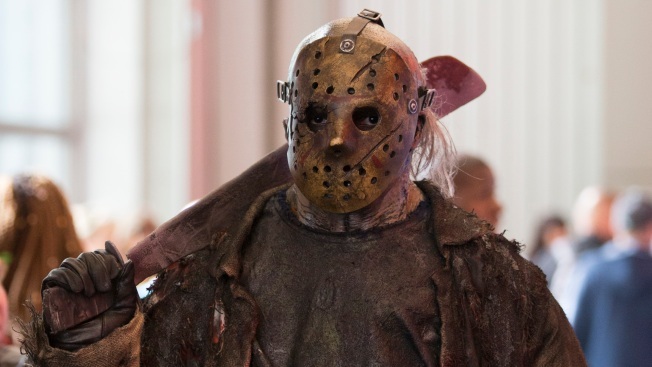 Jason Voorhees from "Friday the 13th" poses in costume during the first day of New York Comic Con in New York City. One of the most dreaded days of the year is here: Friday the 13th. While many of us might be quick to pull the covers back over our heads, do we really know what makes this such an unlucky day? No one really knows. In fact, there are a few different stories that could have played a part in making this one of the most feared days of the year. According to timeanddate.com, the day was first documented in writing in a biography of Italian composer Gioachino Rossini who died on a Friday the 13th. Some people believe there’s a link to Biblical times — there were 13 people at the Last Supper and the crucifixion took place on a Friday. The fear of Friday the 13th really does exist, according to Mathworld. It’s called "paraskevidekatriaphobia" — from the Greek words “Paraskevi” for Friday and “dekatreis” for 13. Mathworld says it may be one of the widest spread superstitions in the United States. Friday the 13th can occur three times in a calendar year. In fact, this is the last one for 2015. The month must begin on a Sunday in order to have a Friday the 13th in any month. If you just can’t fathom the thought of leaving the house, here are a few known facts about Friday the 13th that may make it easier to cope. Italians believe the number 17 is unlucky, making Friday the 17th an unlucky day. The original "Friday the 13th" film was set on Friday June 13, 1979. But that date really fell on a Wednesday. It was also a successful franchise. A German study explored the relationship between Friday the 13th, and blood loss and hospital visits. The conclusion? There is none. “Our data indicate that such beliefs are myths far beyond reality,” the study said.